When we are talking about ‘Medjugorje, then it is more than just talking about a town in Herzegovina that carries this name. It is about the movement that this name has triggered since six young people indicated that on the 24th of June 1981 Virgin Mary, the Mother of Jesus, in Medjugorje named Gospa, appeared to them, and she is still appearing and giving messages to them until today. The four most important aspects of this movement can be described as this: Firstly, it is a movement of pilgrimage. Until this day, many millions of people have come to this place of pilgrimage from all over the world. 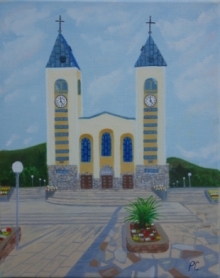 Furthermore, the small place Medjugorje represents a movement of peace. Many people say that they have experienced there the gift of peace in their hearts and they are ready to pass it on to others in their proximity: in their marriage and their family, in their neighbourhood, in their circle of friends, their community and their working place. They are motivated by their own experience of reconciliation and peace and of course by the name which Virgin Mary “Gospa” used to introduce Herself to the visionaries medjugorje : I am the Queen of Peace. Third, Medjugorje can also be called a movement of renewal, which permanently revive the spiritual life people. There is a great number of people who claim that they have had deep spiritual experiences like physical and spiritual healings, conversions, resuming of prayer and faith, impulses for fasting or liberation from addictions. One sign of these renewals, which is more than obvious, is the fact that people started to build prayer groups. There are numerous groups which were buildet by the pilgrims in their communities after their return from Medjugorje. It is a place where they meet, usually once or twice a week, for prayer and adoration, to pray the rosary, to read or to discuss the gospel and Christian life. And the fourth and last aspect: Medjugorje has become the symbol for a movement of humanitarian aid, which is unique. This became especially obvious when the Balkan war began and when it extended into Bosnia-Herzegovina. It was unbelievable, but millions of pilgrims, who had received spiritual gifts in Medjugorje, started now showing their gratitude by helping materially.They sent food, clothes, medicines and other goods, they helped with money and by sponsoring orphans and war victims. This executive summary shows what is meant when someone talks about Medjugorje as being a movement. It should also be mentioned that this movement has been filled with the messages, which the Virgin Mary has given to Marija Pavlovic from March 1, 1984 to January 8, 1987, every week, and since then on the 25th of each month. Of course the messages, which are given to the other visionaries are also a part of this. These messages of Medjugorje consist usually only of a few sentences and are initiations to make the five original basic messages more concrete: faith, conversion, prayer, fasting, and of course peace.